So was going to transcode with ram but noticed it was no longer working. So im trying to get it working with ssd but even though i have the dir set its not transcoding there ideas? Are you trying to transcode in hardware (iGPU) or software (CPU)? 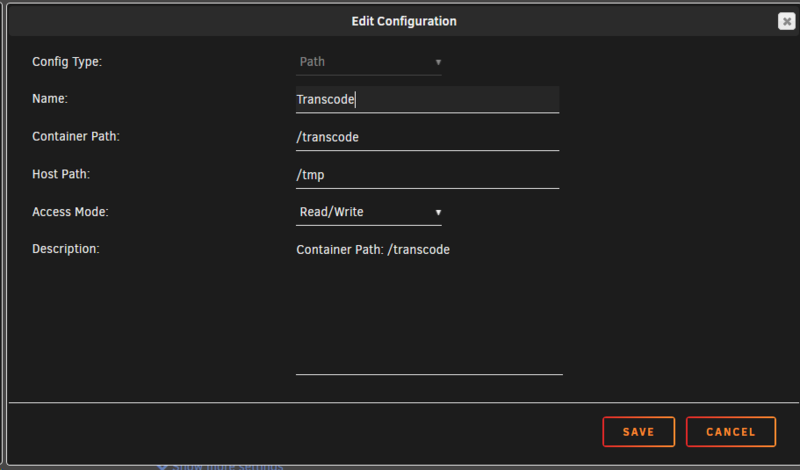 Transcoding in RAM (I am doing this) is simply a matter of, within the Plex docker, mapping the container path of /transcode (or something similar) to a host path of /tmp (or any path not in the array file system). If you specify no transcode volume mapping, Plex will automatically transcode to the Plex appdata/Library/Application Support/... folder. If your appdata share is on the cache drive and your cache drive is an SSD, it will transcode to SSD. well i have it set at /tmp right now as we speak and i didnt notice any difference under my memory load so was not sure it was working. Then i saw article saying it was no longer supported so i figured that it was not. Were do i see the /tmp/transcode session folder at? On the unRAID console, terminal session from the GUI, PuTTY/SSH session, etc. type 'cd /tmp/Transcode/Sessions' then do a directory listing. Perhaps it is not properly configured in your Plex docker/Plex? ok give me a moment to look at those again thank you so much!! but i see tmp in my appdata on my array? Then, again, you likely have something misconfigured in the docker. Which Plex docker are you using? Post your docker run command as explained in the linked discussion. ok so i got plex up and running again and it does look like activity one my ram!!! 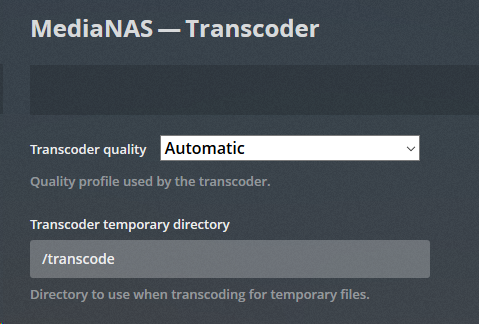 however i put on 2 diff shows on 2 diff machines and it still only shows up as 1 transcode instead of 2 is that normal? You have to be careful if you're transcoding to RAM while using the Plex DVR. I learned this the hard way. Basically while Plex is recording something it is also "transcoding" it to break it up into streamable sections. It does this so that just in case you want to watch while it's still recording. The rub though is that depending on your amount of RAM this can quickly fill it up. I had several recordings fail before I figured out what was actually going on. Not everything has to be transcoded. If the client can direct play the content because it is in a natively supported format, no transcoding takes place. It could be that only one device needs to transcode the content and the other(s) can direct play most content. nVidia Shield for example can direct play just about anything and Plex rarely needs to transcode content streamed to the Shield. I generally only see transcoding on content being played remotely or on certain mobile devices. What I posted in my transcoding screenshot last night was two transcodes taking place for remotely streamed content and the Plex DVR recording simultaneously.